It's just been announced that United States President Trump and the North Korean leader Kim Jong-un are going to meet face to face. This will be the first time that leaders of the two countries have ever met. Hi guys! I'm Charlene from BBC Learning English. It's just been announced that United States President Trump and the North Korean leader Kim Jong-un are going to meet face to face. The meeting is due to happen in the next few weeks and if it goes ahead, it will be the first ever meeting between the leaders of the two countries. Everybody's talking about it, and I'm asking three questions to find out the actual words people are saying. Question one. Are you surprised that these two leaders are going to meet? Yes, definitely. I'm surprised that they've agreed to meet. No, I'm not surprised about that because they are leaders, so they have to meet, like, it has to be done, I think – I guess. Yeah, I am quite surprised, yeah, I didn't think it would happen. Where do you think the meeting should happen? I think maybe in Europe, because it's in the middle of these two countries. I think it should take place somewhere neutral, possibly in Seoul in South Korea. Maybe on a neutral territory, maybe even UK, yeah neutral, definitely; not the States, and not North or even South Korea. What do you think the outcome of this meeting will be? I think it's difficult to say what the outcome would be, with the two personalities that are involved. I don't think anything will be decided. Neither of them listen – they just talk. Hopefully, they'll come together over the next few years, few decades…so generally a bit of reconciliation between the two countries. 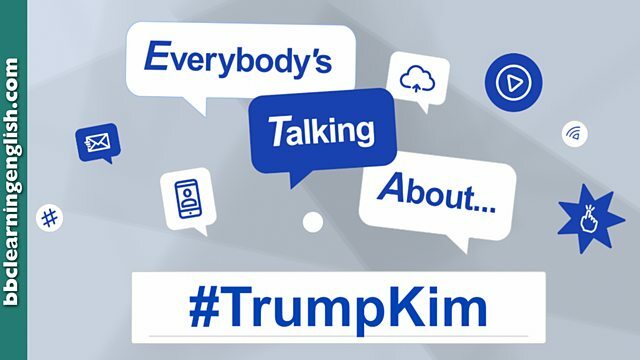 So there you go: Everybody's talking about #TrumpKim and now you can too! There's a quick recap coming up in just a second – but don't forget you can find out lots more about this topic at BBC Learning English dot com. You can also find us on Facebook, Twitter, Instagram and YouTube - and get talking! See you next time! There are three vowels in this word. Choose the correct spelling of this adjective that means 'not favouring or benefiting one thing over another'. This word is the past participle form of a very common verb. Which phrase is a polite way to indicate that a situation is so complicated that you can't be certain about its outcome? Which word do we use with questions and negatives? Complete this phrase: 'I don't think ______ will be decided'. No, I'm not surprised about that… it has to be done. Maybe on a neutral territory, maybe even UK, yeah neutral, definitely. Hopefully, they'll come together over the next few years. Are you surprised that these two leaders are going to meet? Where do you think the meeting should take place? What do you expect the outcome of this meeting will be? Send your comment to us by email. Please write '#TrumpKim' in the subject line. We'll publish our favourite emails here on this page. We can't reply to individual comments, but we do read all of them! The meeting between Trump and Kim Jong-un is certainly a unexpected event. In the past their words are felt all of us at risk of a possible new big Mondial War, but now with this meeting i believe this situation going to placate tensions. I agree with the people who thinks that the meeting should be in a neutral territory. This decision wolud be a signal of mutually intention of meeting half way. In conclusion, i want to be positive and i say the outcome will be better than you might think. No, I am not surprised about their meeting because any a bright future can only be achieved through a path of peace which should have done long time ago and now it would have already rewarding a great deal to the relevant population ,though it is not too late this is like a straw in the wind. I think meeting should take place where each one of them will be comfortable and neutral. It is difficult to say, hopefully as the saying goes that where there's a will there's a way.